I couldn’t watch the Oscars last night as it would not air here until 2:00 AM. Darn, I hate time differences. I just looked at the list of the winners and heard some of the major category winners on the news this morning. I am sure that most of you enjoyed watching the show and cheered for your own favorites. 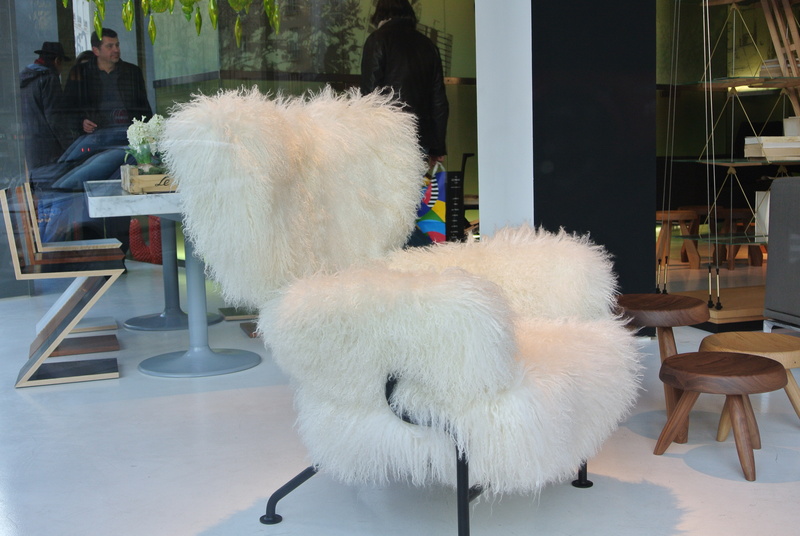 We went to Galerie Lafayette (a beautiful mall in Paris) to do some shopping on Saturday. I don’t know how we walked all the way home, but we did. We stopped along the way into a few shops and then we came upon something that looked familiar. 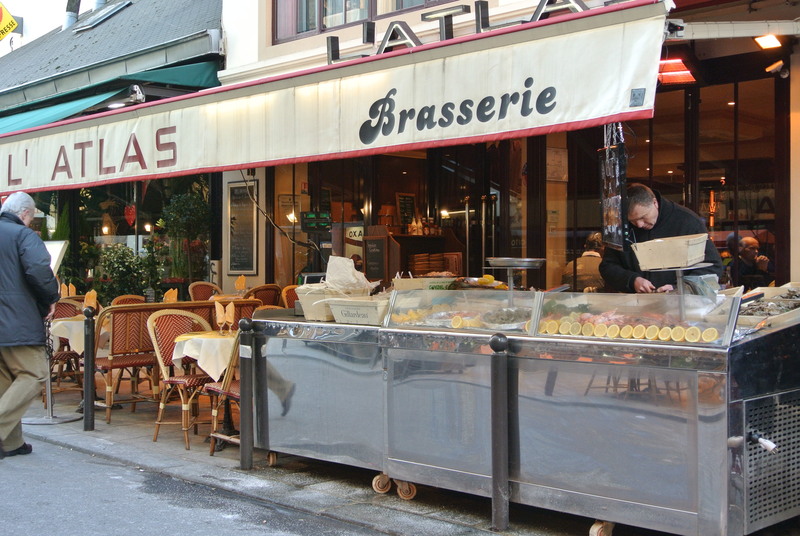 In the opening scene of The Tourist, the movie with Johnny Depp and Angelina Jolie, she is seated at a table sitting in Place Colette. We walked over and I snapped this picture here of Saturday shoppers time out. There was an orchestra playing and it was just totally awesome. I thought this is probably the closest I’ll get to Angelina Jolie! 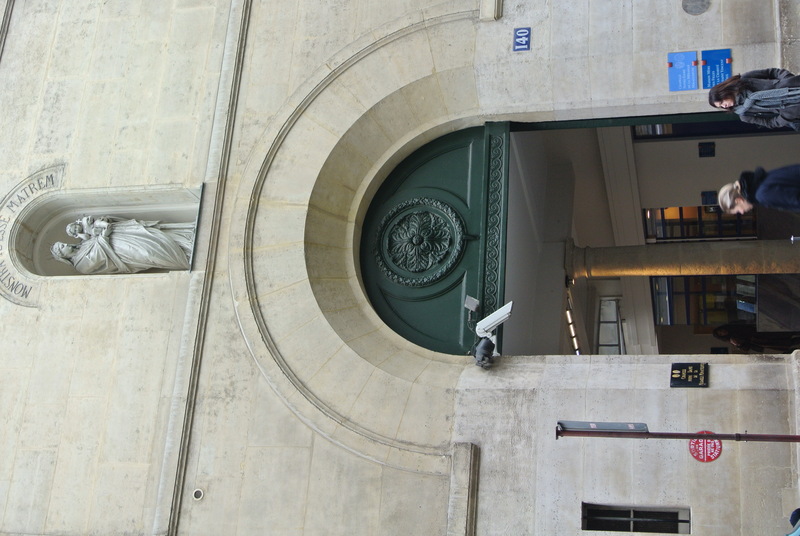 When I turned around, there it was, the beautiful entrance to the metro station for the stop Palais Royal. The seat was empty and voilá! I found some two pictures on my iPod and would like to post them here before they get lost. This one is of my husband and myself on our Harley. The bottom one is my homemade bread. I miss baking here because I bake almost everyday at home. and I was listening as I walked along. It was quite wonderful really. I have started giving directions in Paris, I can’t believe it but true. I can’t do it all the time, but we certainly have learned our way around. Have I told you one of the things I love to do here is when ever I see someone left out of their own pictures, I always offer to take the photo. Of course, they look at me right away to check me out that I’m not going to run off with their camera! No seriously, I just love to offer to take the picture, why go home and someone is left out all the time. By the way, we rented the movie, The Way again. Our guest has not seen it yet, we wanted to share it and because we could not watch the Oscars like the rest of the world! I have to say it was just as good the second time around. I just love that story. I now officially have to add doing the Camino de Santiago de Compostela pilgrimage to my bucket list. I would seriously love to do that. I am experimenting with backgrounds for the blog. 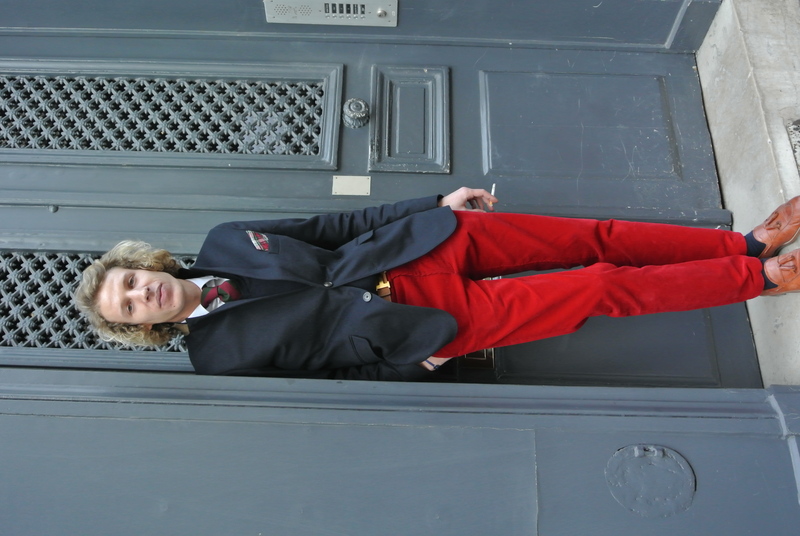 I am considering this photo taken on a beautiful Parisian street. I don’t know but I think I might keep changing them to see what goes best. This one might be too busy and too me! Tomorrow I’ll tell you what we did on Sunday, but for now they are waiting for me. We took a walk to Les Invalides today. 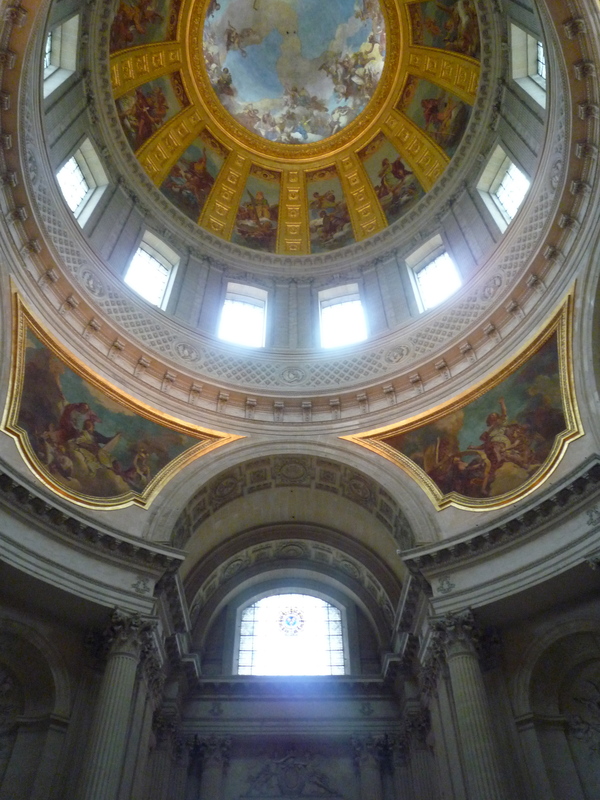 There are many buildings and monuments at Les Invalides. It is the military history of France and the tomb of Napoleon Bonaparte is here as well. 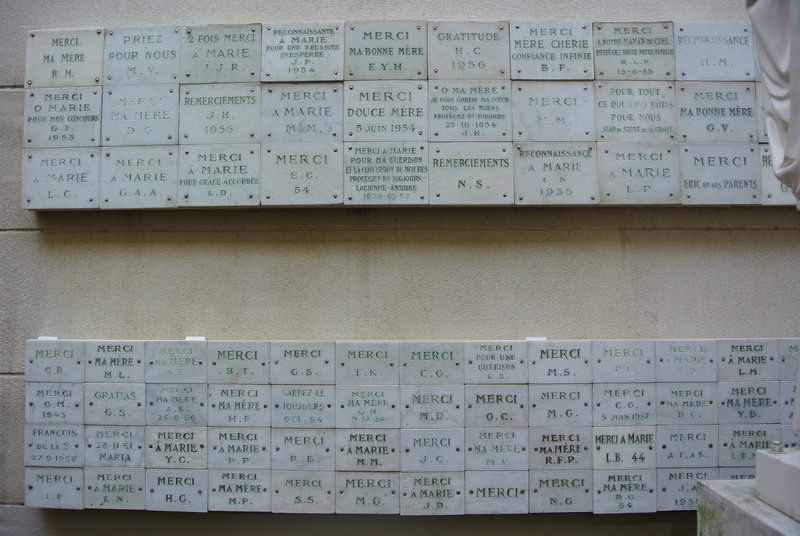 It is a hospital for the war veterans of France. It serves as the resting place for France’s greatest military heros and Napoleon II the son of Napoleon is entombed here. 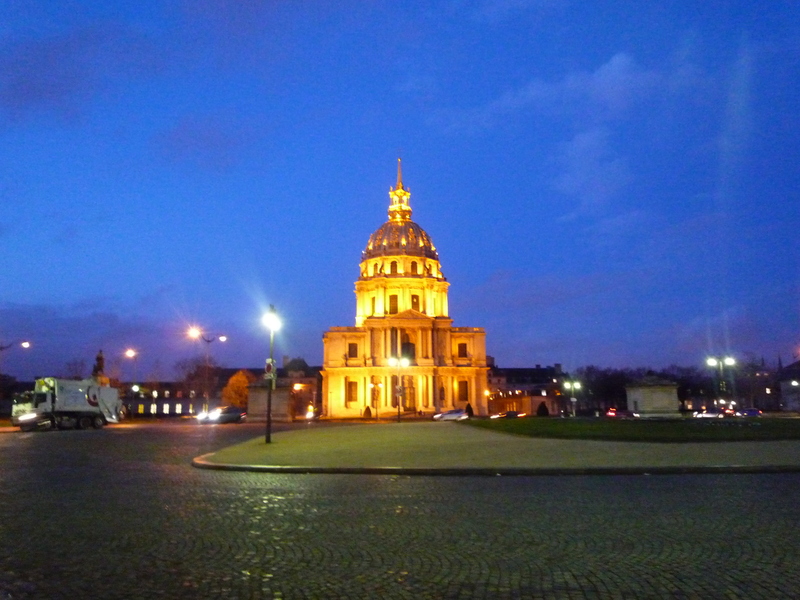 The dome at Les Invalides which is especially beautiful at night. It was inspired by the dome of St. Peter’s Basilica in Rome. Napoleons is buried in seven coffins. Some are lead, tin, mahogany and granite or marble. This is why it is so large. It is such a beautiful building with beautiful adornments, stained glass windows, paintings, niches and it’s scale is massive. We walked through the Musée de l’Armée which is always amazing. They have added some new permanent exhibits to show the vast collections. It is amazing to see the hundreds of suits of armor and the collection of weaponry and canons. It makes you wonder how fit these men and horses were for that matter, to carry the heavy armor and then to be able to fight bearing the weight. I took this picture because it is so beautiful when it is illuminated at night. There is a beautiful crucifix where I had this picture taken below. If I may stray off the subject for a moment, would like to interject a personal item I found that I love. 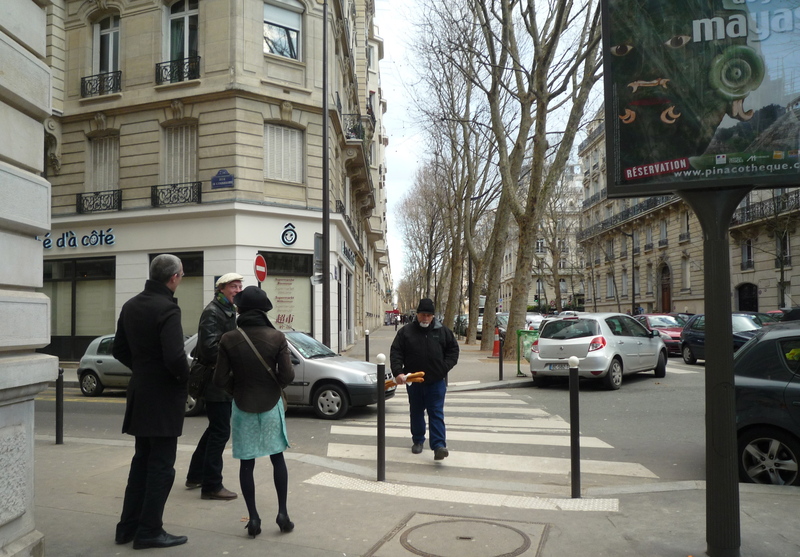 Each and every day we walk at least 5 miles because as you may know Paris is a very pedestrian friendly city. I am able to do it on the concrete pavement because I have a secret in my shoes! Because I have been asked to mention some things I like, I will tell you about something I do enjoy wearing. I wear a pair of Shiatsu Acupressure Insoles in my shoes. They are great. They say they combine acupressure, reflexology and magnetic therapy while hardly taking up any room at all in your shoes. I change them everyday to different pairs of shoes. All I know is they feel good under my feet. I am not being compensated by mentioning and talking about these in any way. 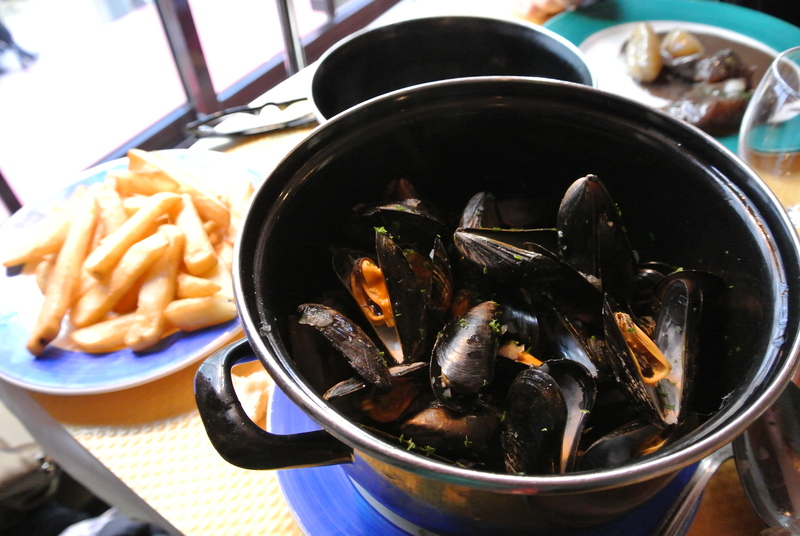 On Ash Wednesday, we did go to get our ashes at Notre Dame de Paris and afterward found a quiet little restaurant where we enjoyed some fish. 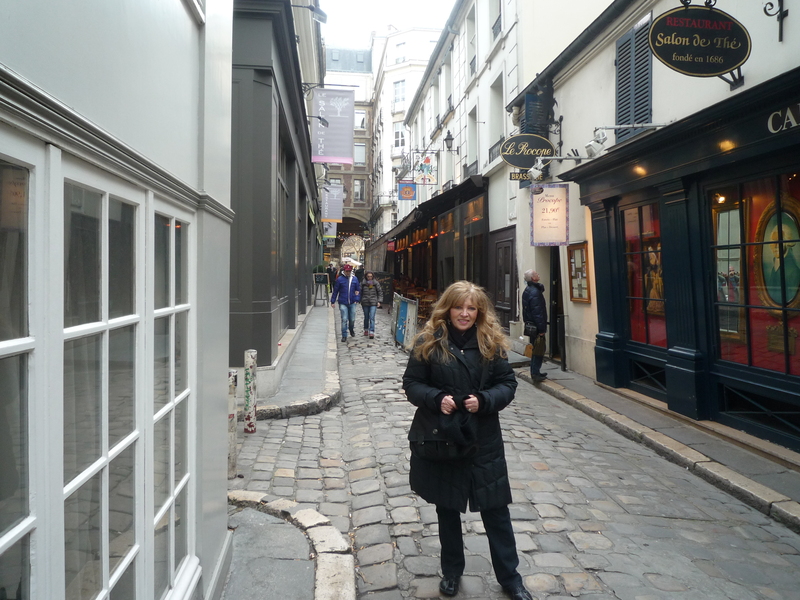 When we were walking around, we came upon the most amazing street. I have included a photo here. I love to take the metro in Paris. We took the subway to Concorde, which is a beautiful station painted purple with purple chairs. 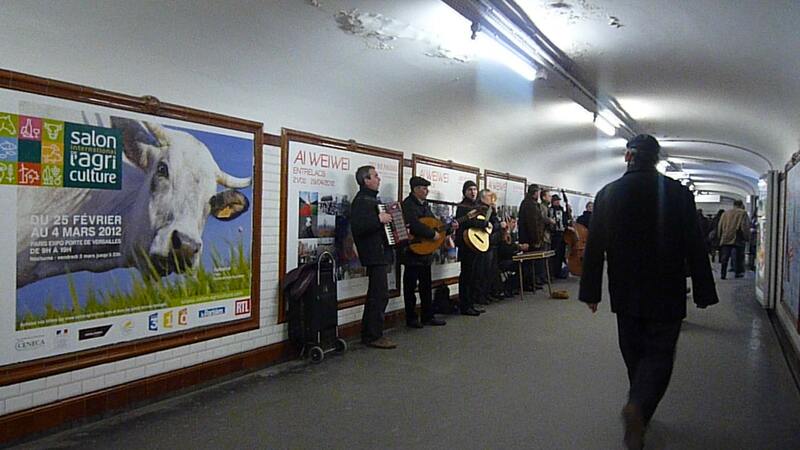 We changed over to another line heading for the Abbess Station in Monmartre. This is a photo of the Abbess Station which still has the old glass over the top which says Metropolitain. After you get off the train and walk several small blocks, you are faced with this immense flight of steps, which number over 300. These are the steps up to the base of the Basilique du Sacré Coeur, Just kidding, there is also the Funiculaire de Monmartre which is an electric rail car if you prefer. You can see it to the right side of the staircase in this picture. The Basilique du Sacré Coeur is a Roman Catholic Church which construction began in 1875. It sits high on a hill above all of Paris and the views from there are fantastic. It is a very beautiful church made of limestone. 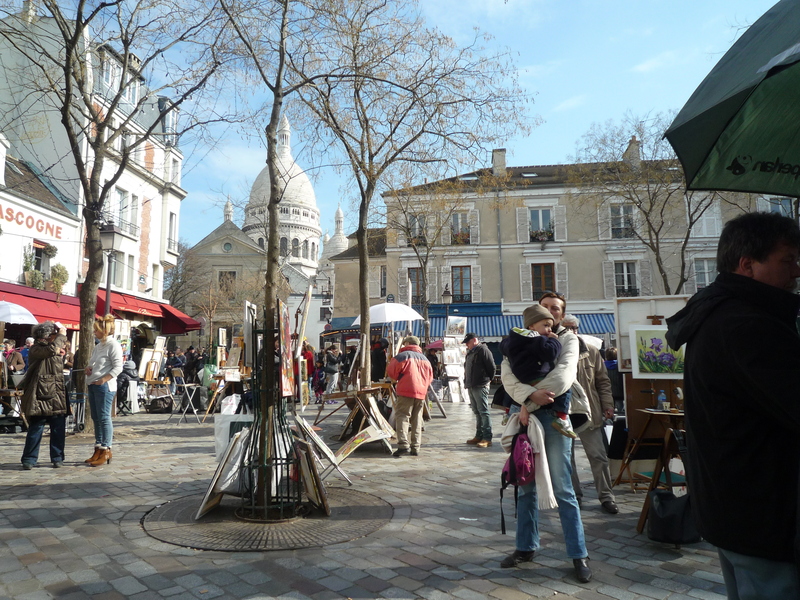 Monmartre means the hill of the martyr as St. Denis was said to have been beheaded here. He was the Bishop of Paris. I took this photo to the left from inside the Funiculaire on the way up. 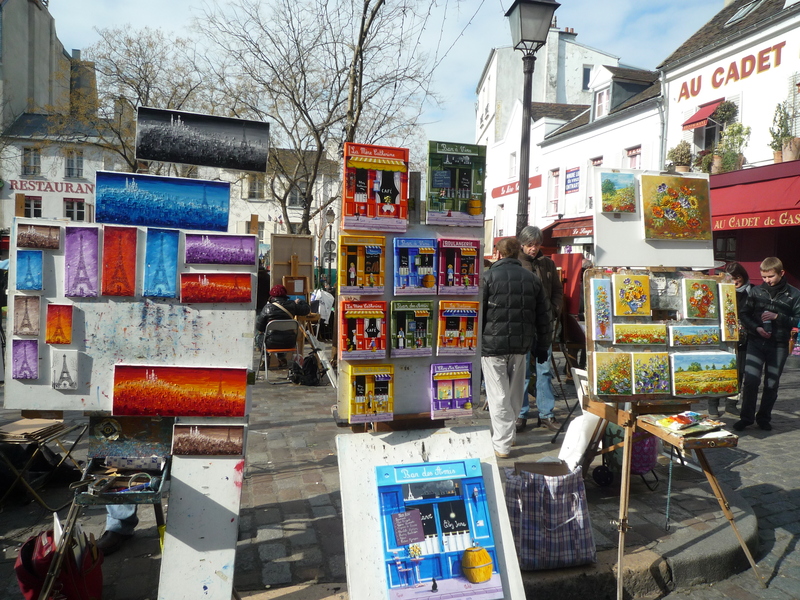 Monmartre is where you will find the artists. If you would like a portrait to take home, it is here that you will want to go. Not far from here is the red light district called Pigalle. 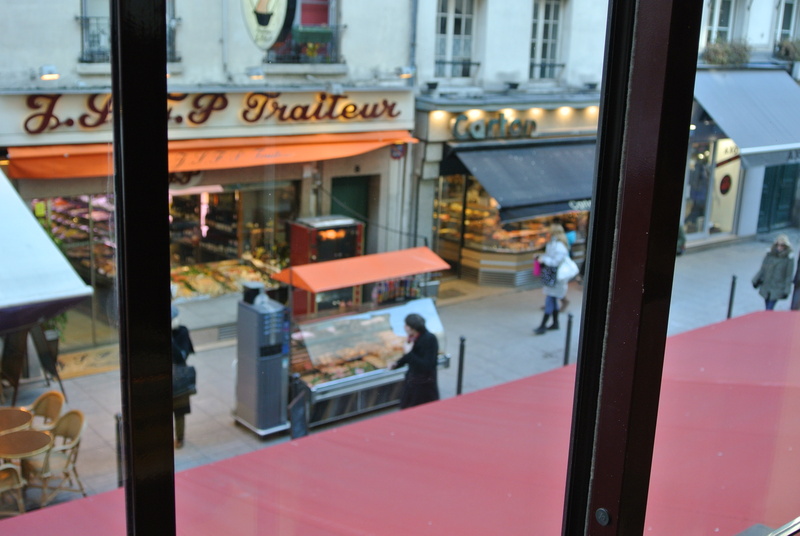 In Pigalle, you will see the Moulin Rouge, nightclubs and concert halls. You may remember Maurice Chevalier singing about Place Pigalle. Mr. Chevalier was born in Paris. 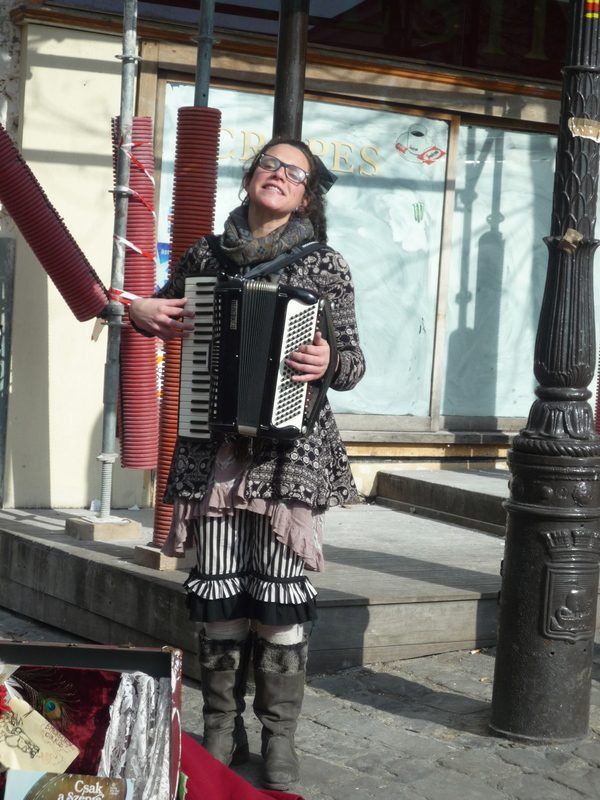 This was a street entertainer in the Village of Monmartre. This talented entertainer sang and played the accordion. After a few more steps you will come upon another. You will hear them in the metro stations as well. It was just a beautiful afternoon to walk around the square viewing all the different paintings and sketches offered for sale. It is such fun too to pause and watch the artist’s hand while he is drawing a portrait. It is really something to watch how one can transform a blank sheet of paper into a beautiful work of art. We found a wonderful little restaurant not far from the Basilica and stopped to have lunch. We are still talking about how much we enjoyed the meal. We walked back to the metro station to catch the train back. As we were changing trains at Concorde, we met with the most fantastic Russian orchestra. They were so talented and fantastic to listen to that we just had to stop. I pulled out my camera to take a photo. How often do I get the opportunity to enjoy an authentic Russian Orchestra? I hope I get the chance to catch them again because I would really love to buy their CD to enjoy at home. I have to say it again, they were so good and it was so much fun to listen to them sing and play. It was a great day in Monmartre. We took the bus to Place du la Concorde so that we could walk the rest of the way through the beautiful Jardin des Tuileries. 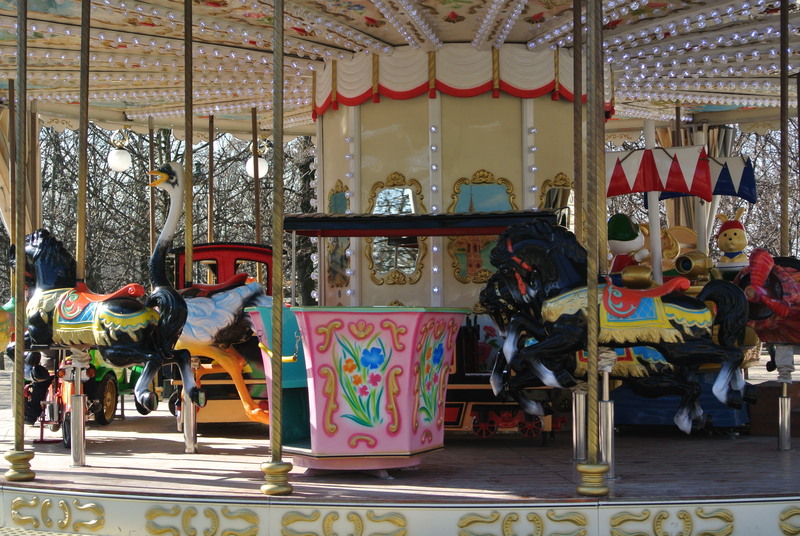 The park is just enchanting with a carrousel, gorgeous statues, fountains, sculptures, topiaries, ponds and lovely gardens. 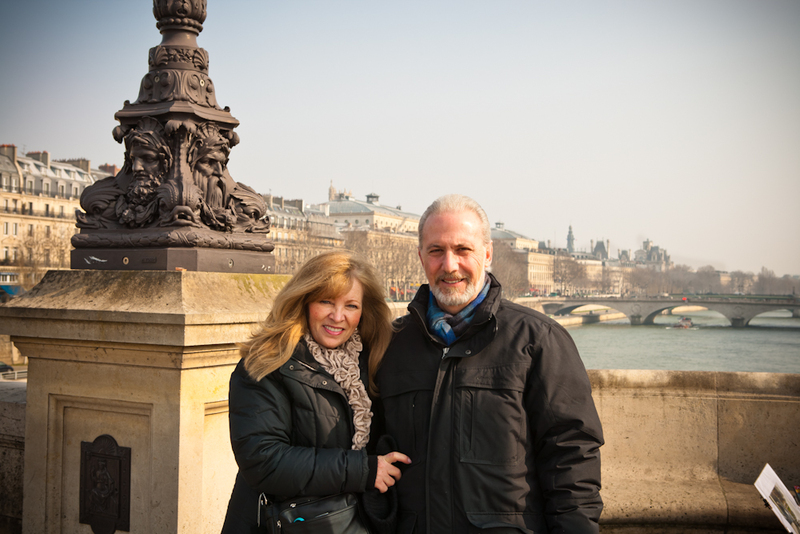 We could walk through the park right to the Louvre, which is where we are headed today. We always look forward to spending time and exploring the different wings of the Louvre. The Denon wing was to be our choice. 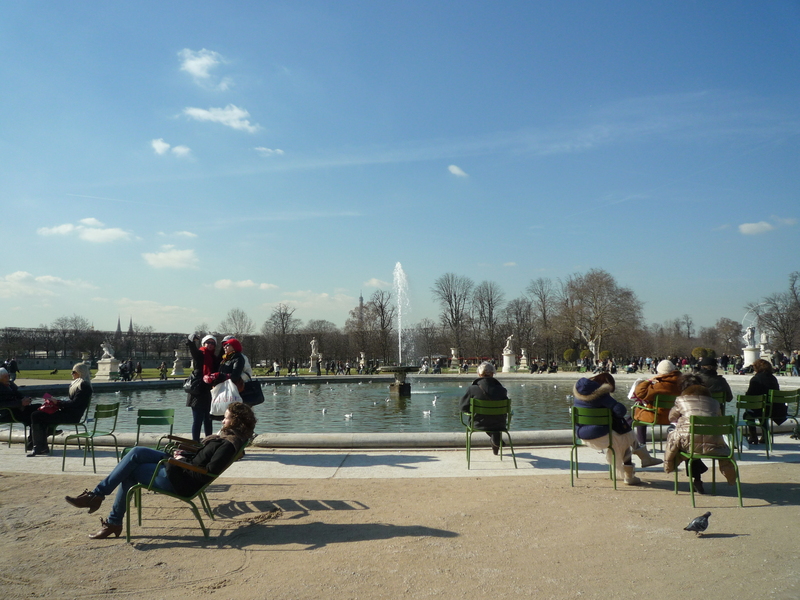 It was such a beautiful sunny day here in Paris as we walked through the Tuileries. We stopped by the carrousel first then on to the pond where people were taking the sun and enjoying the blue skies. You can see the beautiful statues in this picture. We came upon the topiaries which are just so perfect and continued on. When we got near the entrance to the Louvre which is the glass pyramid, I took this picture. 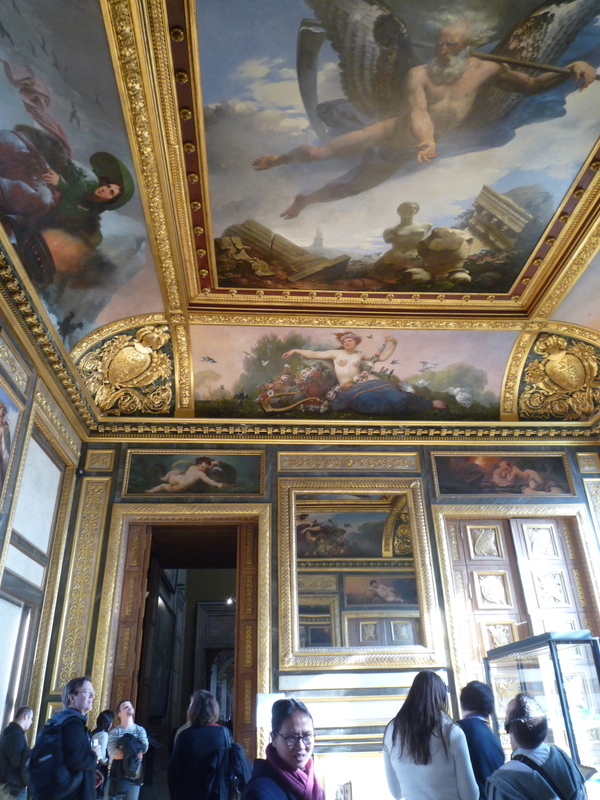 What a treat to have time to stroll through the Louvre in Paris, which opened in 1793. It is one of the largest museums in the world and remains the most visited. We came upon the painting of the Wedding at Cana, by Paolo Veronese painted in 1563. The painting depicts the story of the first of seven miracles performed by Christ where he turned the water into wine. Beautifully embellished and painted ceilings, room after room. The Mona Lisa by Leonardo da Vinci painted in the very early 1500’s, is the most famous painting in the world. If you just follow the crowd they are all headed in this direction. 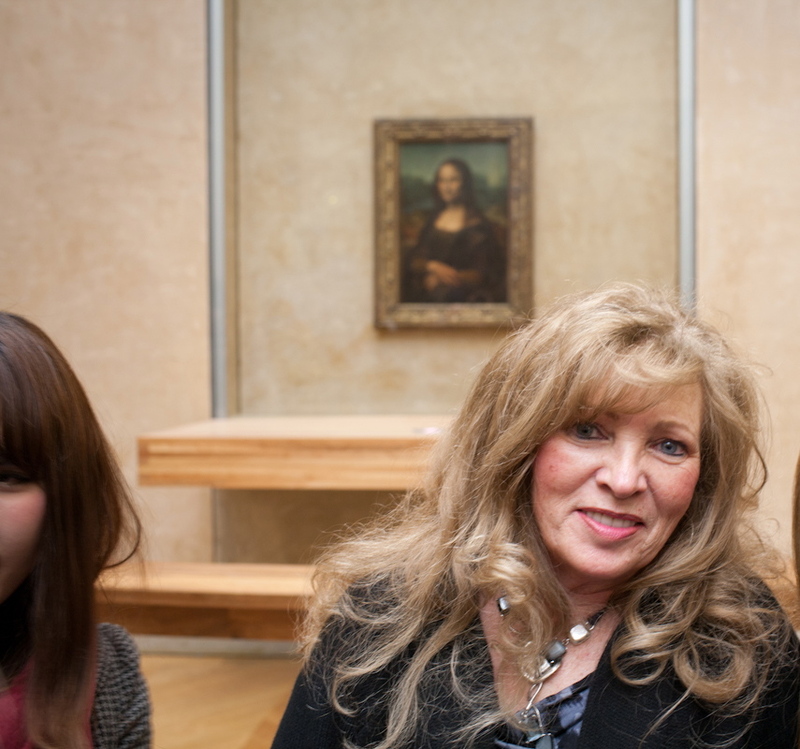 I couldn’t help myself but to post this picture of the Mona Lisa and Elaine! 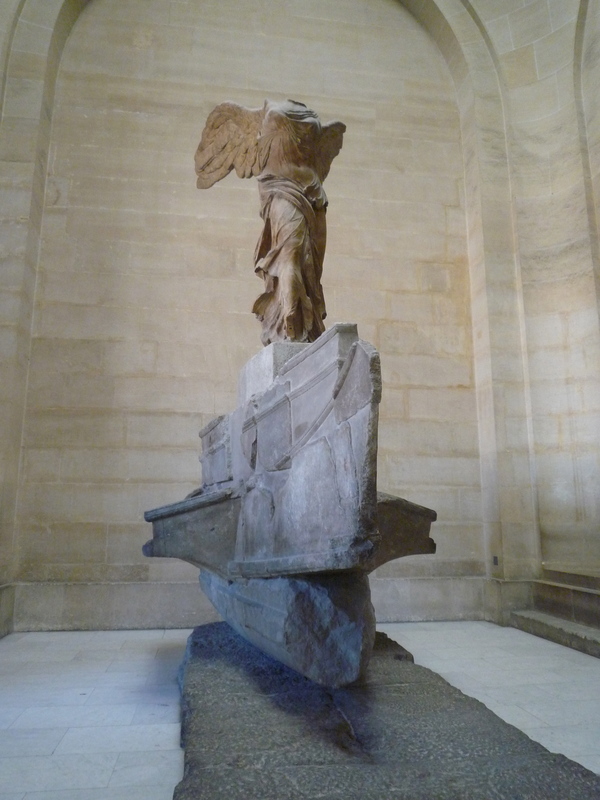 The second century Winged Victory of Samothrace is prominently displayed at the Louvre in Paris. Made of marble, it is the most popular sculptures in the entire world. It honors the goddess Nike as well as the sea battle. We sought out the ancient Greek sculpture of Venus de Milo which is one of our favorites in the Louvre. We located it and admired her for sometime. After several hours of compete immersion in the wonders, beauty and history of the Musée du Louvre, we were completely ready for coffee and dessert. 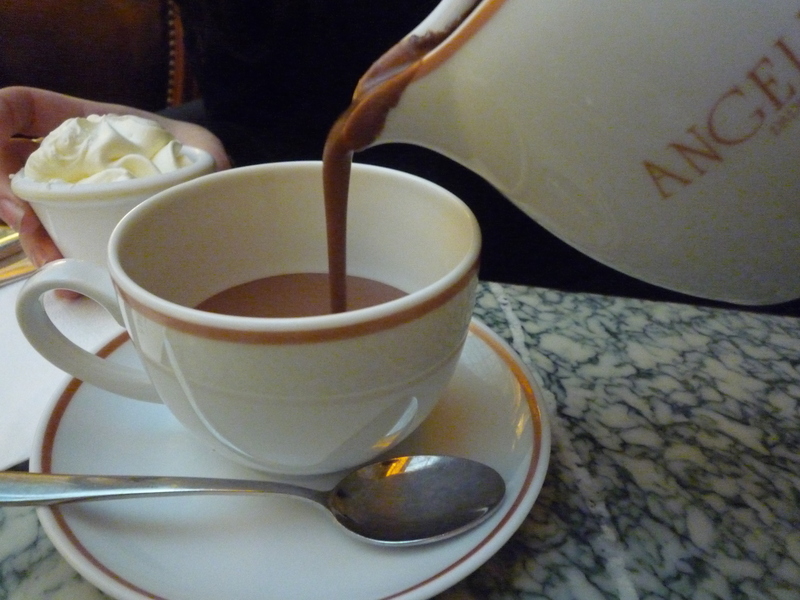 We headed straight for Angelina’s, a famous café in Paris known for the decadent chocolat chaud (hot chocolate). 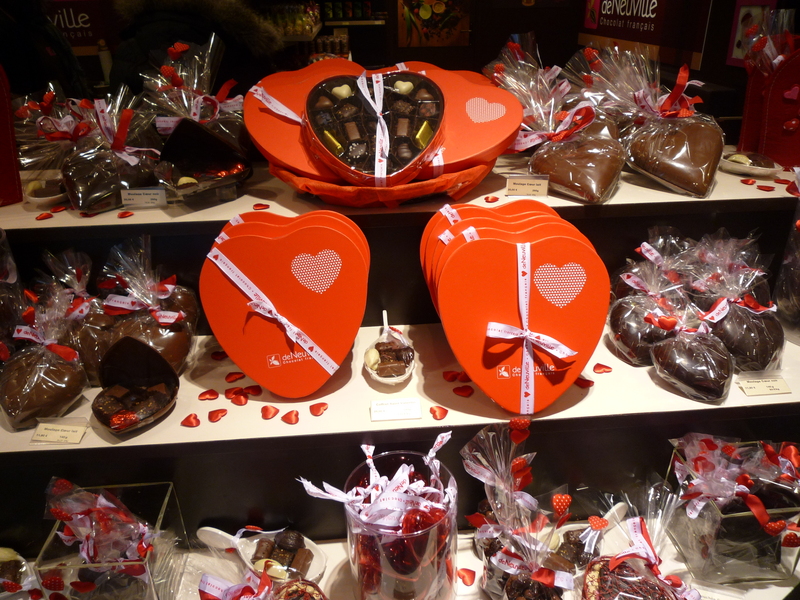 That is exactly what we ordered along with some delicious and beautiful treats. As you look at the photo of the hot chocolate, think of melted chocolate being poured right into your cup. Then add the delicious whipped cream which accompanies it. A superb reward I dare say. 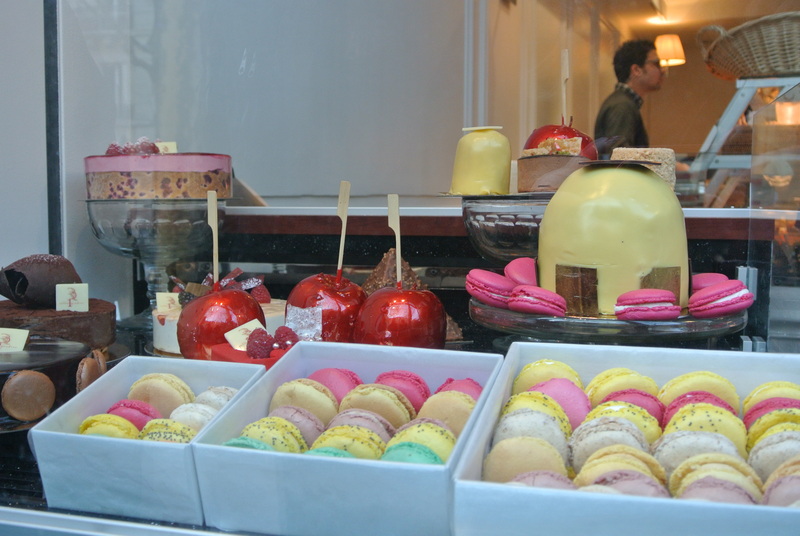 It is safe to assume we’re all enjoying the city of Paris one treat at a time. On Saturday, we had a special relative arrive from the states. We took it easy that day to allow him some time to adjust and not push too hard after flying over. We know all too well how the day of arrival feels. After having breakfast and enjoying some good conversation, we took a walk around the neighborhood to show him the local stores. We did go out to dinner later on that evening. 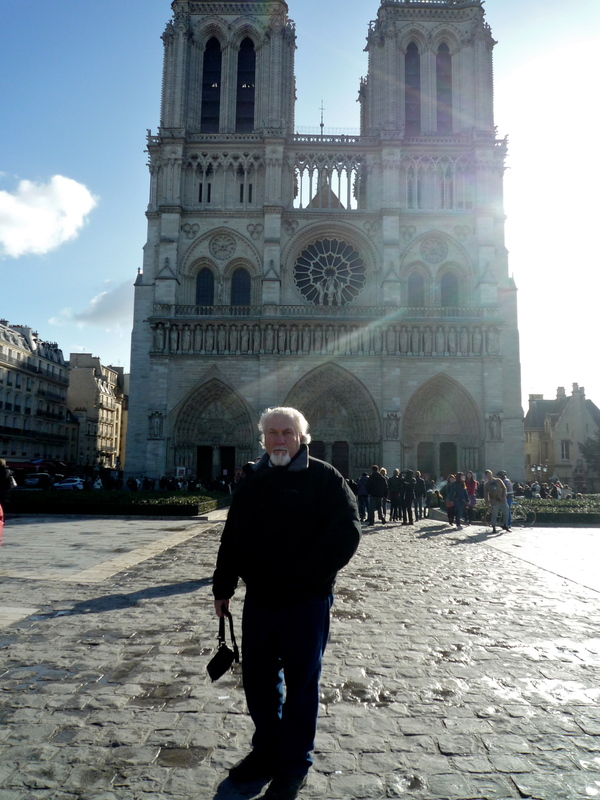 As you probably know, I love to go to Mass at Notre Dame in Paris. We attended the 11:30 AM Mass which was the International Mass, so the gospel was in English. I can follow along in French now, and know the songs to sing along. I love that it is becoming familiar to me. The choir dressed in royal blue long robes are always amazing to hear. The vestments worn by the priests were green for Ordinary Time which means nature and new growth. I had to take a picture of the beautiful kebobs served in the restaurants. We walked over to the Latin Quartier where we ended up voting on whether we should have Moroccan for lunch. 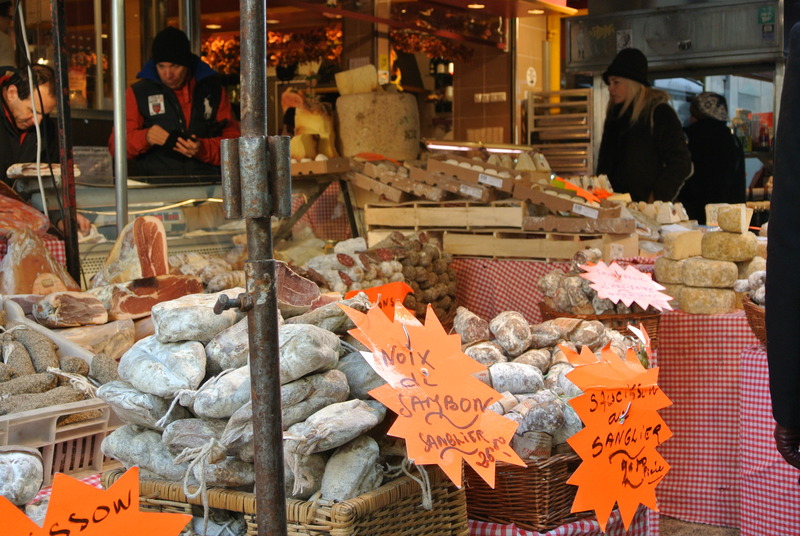 We all agreed and went into The Nouveau Village, located at 9, rue Xavier Pravas. 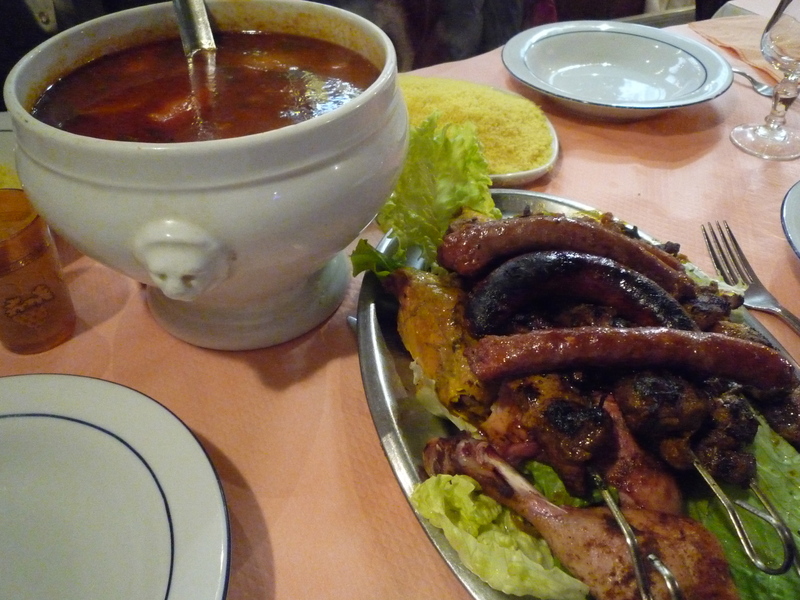 The business card says they offer Specialites Marocaines, offering Couscous, Mechoui, Pastilla, Tagines, and Grillades. The menu was great and offered so many different options. We ordered the Couscous Village. In the meantime, we were given a small glass of wine and we ordered some mint tea. In a Moroccan restaurant the mint tea is so delicious. We were not let down. 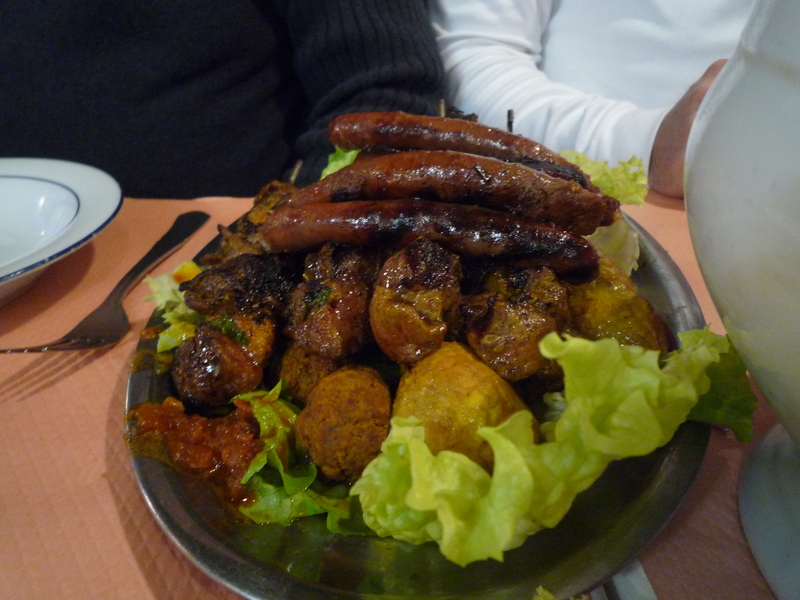 Our order arrived with a platter of perfectly of hot couscous, a platter of assorted grilled meats of chicken, curry chicken, beef and sausage. It was served with large tureen of potatoes, carrots, zucchini, etc., that was served in a hot delicious gravy. We placed the couscous in the bowl, laddled some gravy with vegetables and then add some meat. As you can see here the ceiling was covered with plants hanging in pots. As you can see here, the ceiling was covered with hanging plants which were in pots. It was certainly different and although very small, it was cozy. The waiter was fantastic. He was incredibly funny and so friendly. We ordered the Moroccan mint tea which I think was the most amazing tea I’ve every had. It was so good, we ordered it twice. The waiter would pour the steaming hot tea into small glass cups from about two feet high in the air over the cups and never splash a drop, it was fun to see. Friday nights and on Sunday afternoons skaters take to the streets of Paris. 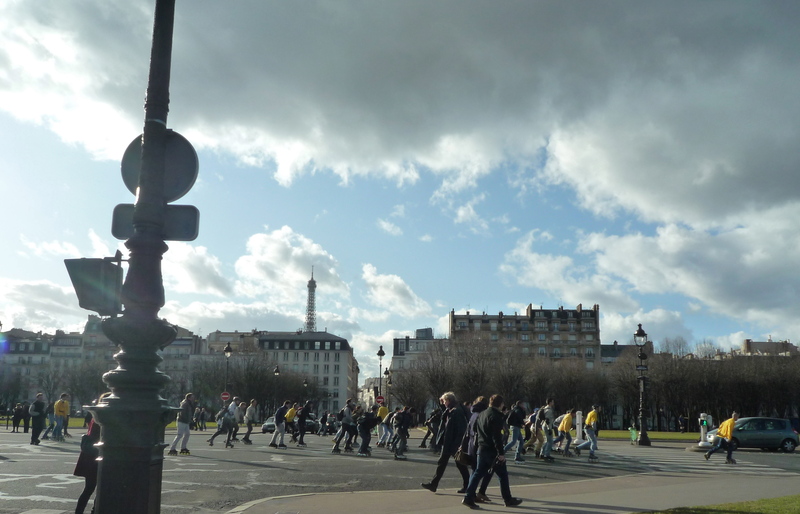 We happened to be crossing at Esplanade des Invalides where we caught a skate. There were hundreds of skaters who were zipping by us who were enjoying the sunny afternoon. 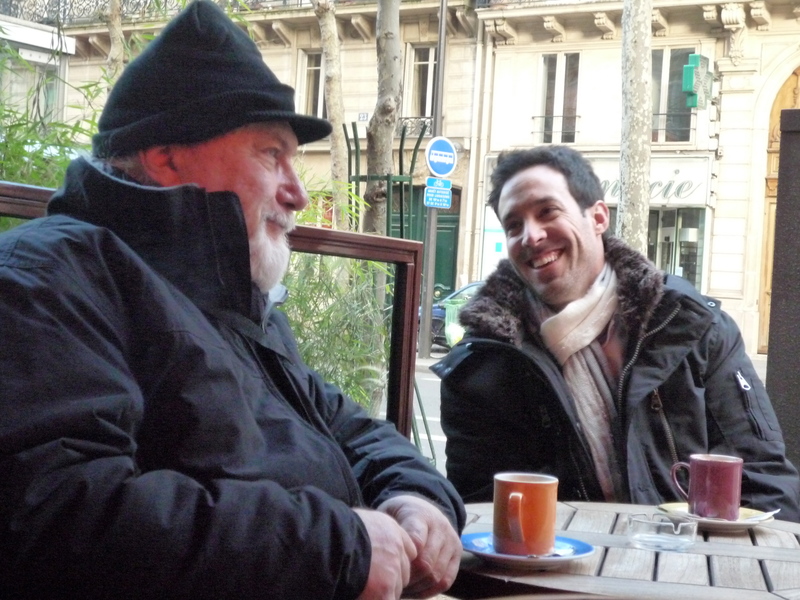 We walked home through St. Germain which was about 2 miles and stopped at a corner café to have coffee and rest a bit. It was a great Sunday in Paris. 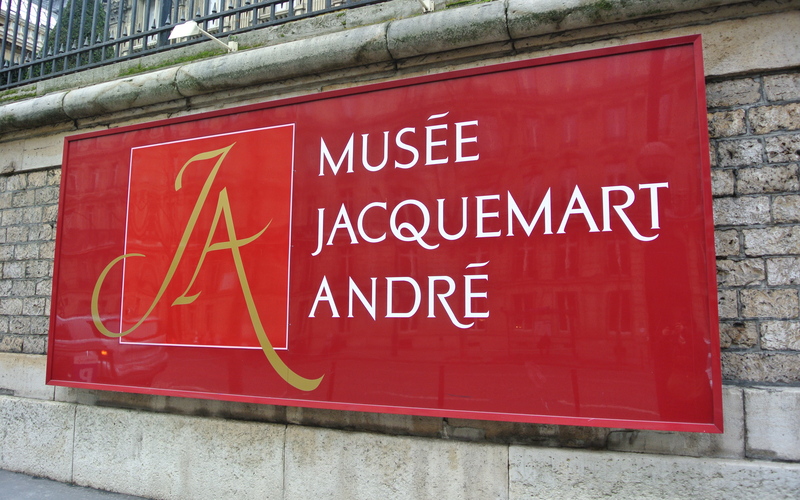 We took the metro to see a small museum, the Jacquesmart-André Musée. It is in a beautiful mansion. We saw the State Apartments, Informal and Private Apartments. We walked through the Winter Garden inside and the Italian Museum. Unfortunately no photos were allowed but I took a few walking up to the entrance. the hill. There is a picture posted below. We look forward to visiting the Hard Rock Paris each winter when we get a longing for a burger. They have real American cheese there as well as Heinz. I ordered the Cobb Salad which was delicious but oversized. This was a beautiful little museum and well off the beaten path of the tourist maps. We are food shopping today, catching up on laundry, running errands, etc. We are expecting company from the states for the next two weeks and will be visiting the main attractions of Paris. Will keep you posted, have a great weekend. 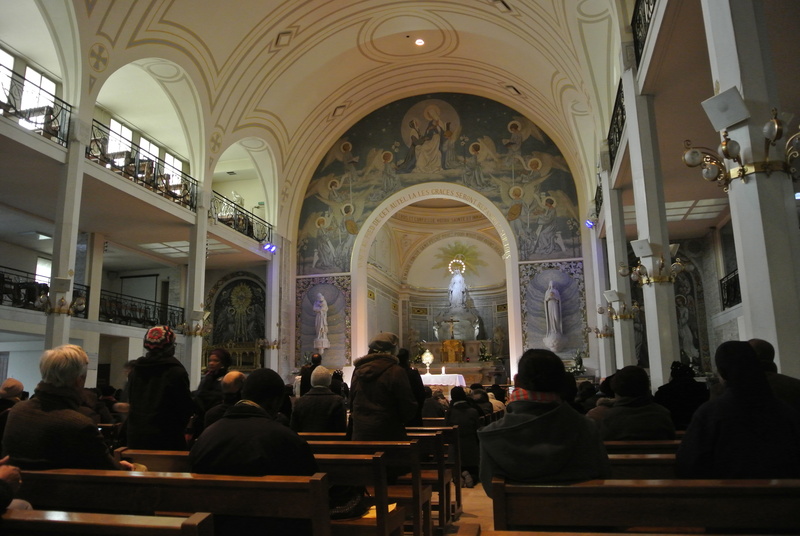 We went to the Chapel of the Miraculous Medal yesterday. I read on a web page that two million pilgrims visit this chapel every year making it the second pilgrimage after Lourdes. 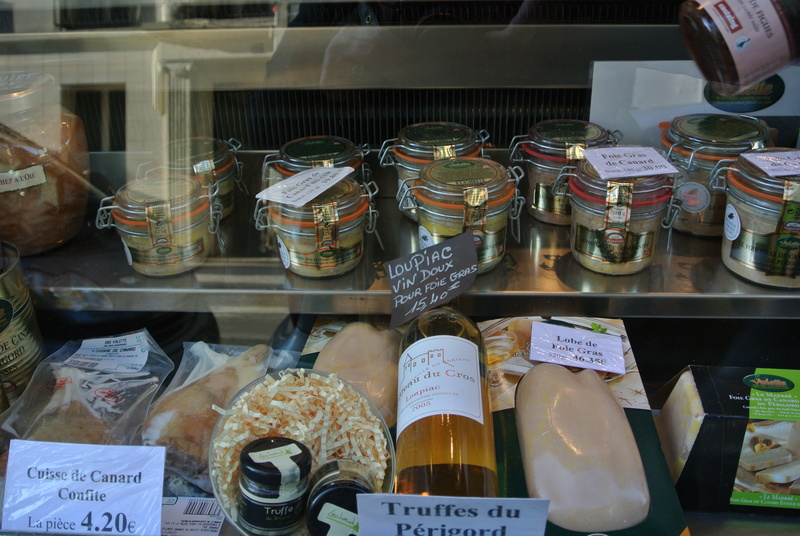 It is at 140, rue du Bac, not far from the department store of Le Bon Marché. There were so many people there and the chapel was crowded. 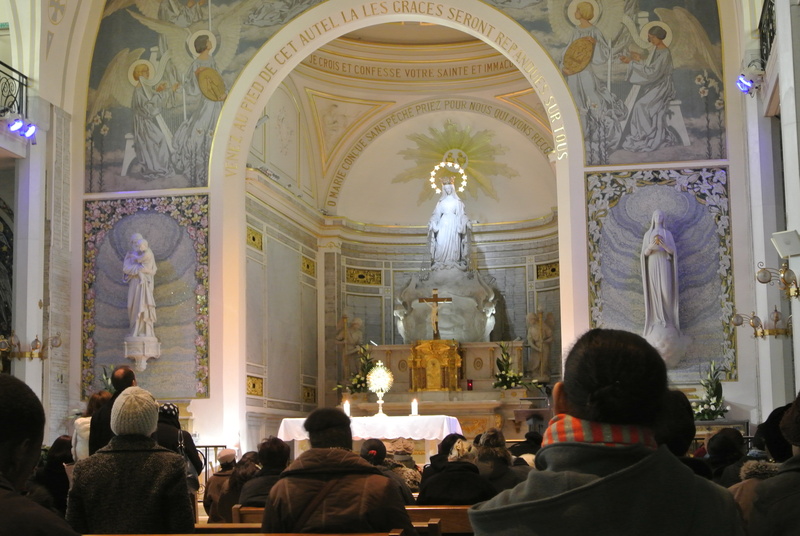 On July 18, 1830 the Holy Virgin appeared to Catherine Labouré in this chapel. 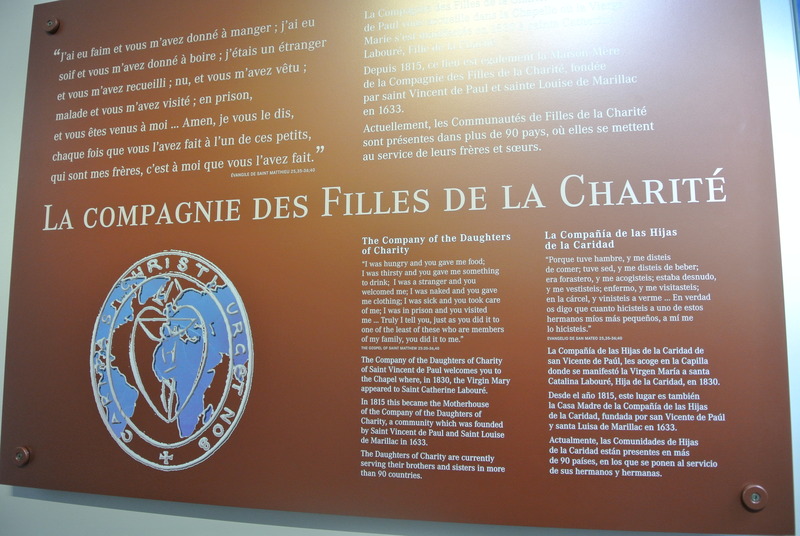 The chapel was part of a convent of the Sisters of Charity, where Catherine was preparing to become a sister. The Blessed Virgin made three apparitions to Catherine. Her body lies in a glass case in the chapel. Pope Pius XII named her a saint in 1947. I, myself, went to a parochial elementary school which was taught by the Sisters of Charity. 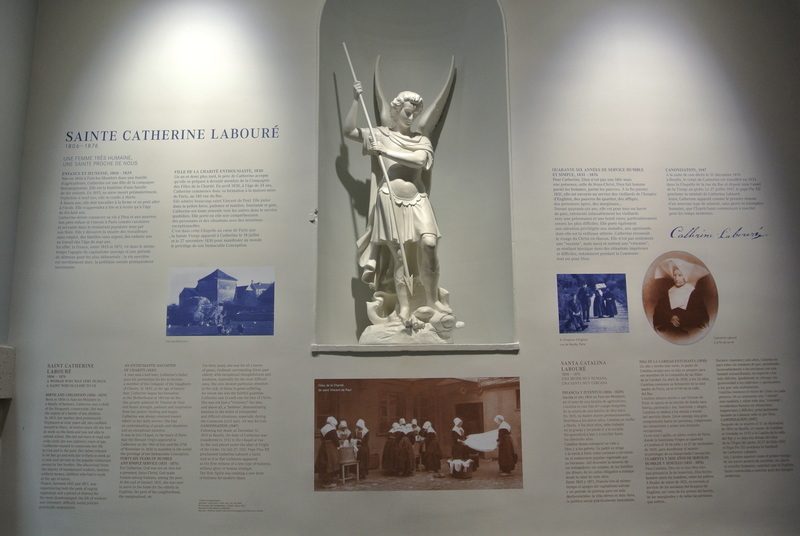 The design of the medal which would become known as the Miraculous Medal was revealed to Catherine by the Virgin Mary. On the front side, which is the luminous side, is an image of Mary, surrounded by the prayer, “O Mary conceived without sin, pray for us who have recourse to you.” Mary is standing on a half globe with her feet crushing the head of the serpent. The serpent representing the devil. Her hands are open from which rays of light fall to earth. The light is the way. In this way Mary invites us to have recourse to her in the difficult moments of our lives, with total confidence in her all-powerful and loving intercession. The reverse side of the medal, which is the sorrowful side, has the letter “M” surrounded by a cross (the bond of Christ to His Mother) and over two hearts, one encircled by a crown of thorns, (which recalls the Passion of Christ), and the other pierced with a sword. Her head is crowned with twelve stars, which depict the 12 apostles and represent the Church. 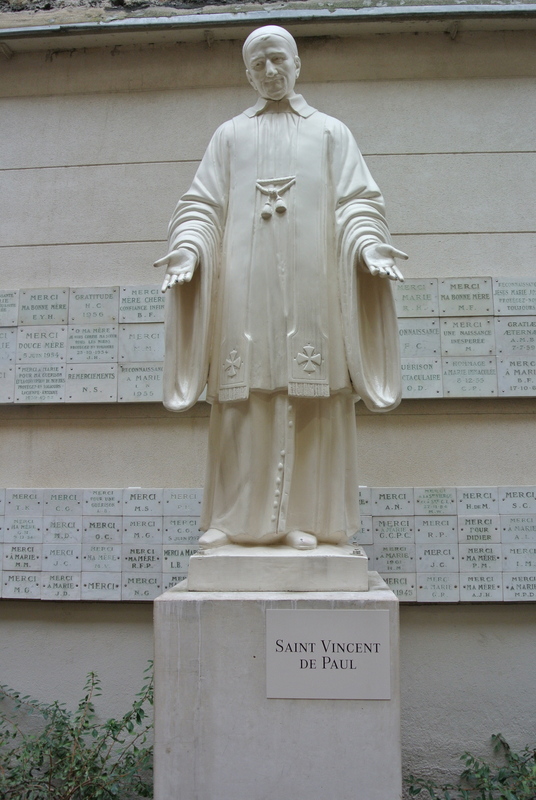 St. Vincent de-Paul was the founder of the order. I bought medals, postcards, rosaries and books which tell the story. Part of this information was taken from a little pamphlet given there. I was so happy to have the opportunity and hope to visit there again soon. I would like to remind you that you can enlarge any photo by clicking on it to see it better. I try every year to see all the movies nominated for an Oscar. I’m way behind this year, so yesterday we decided to see a movie in the afternoon. I checked it out online and saw that the movie The Descendants was playing at La Pagode. I love the La Pagode cinema. 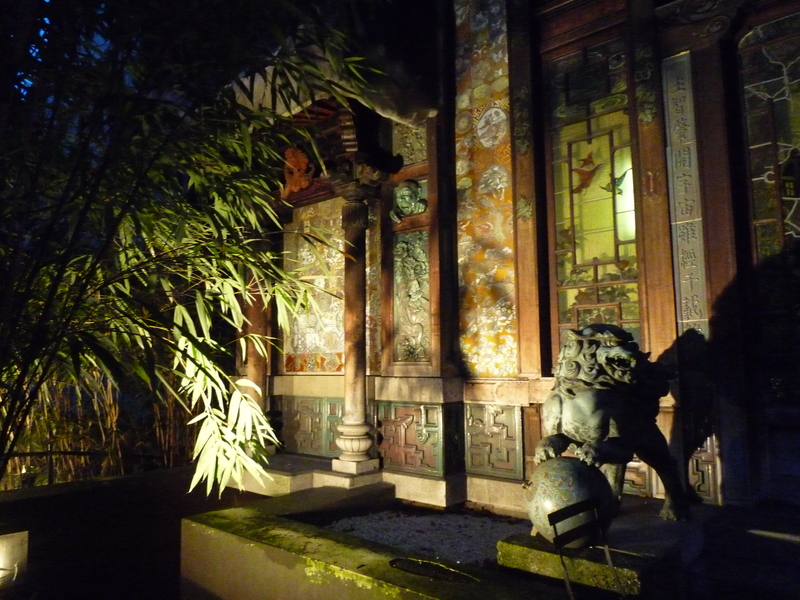 It is an authentic pagoda moved from Japan and was originally used a ballroom for the house next door which belonged to Mr. Bon Marche (of the famous department store in Paris) and his wife. After they divorced in the 1930’s it was turned into a movie theatre. It is beautiful and I always love going to see a movie there. It must be about a mile and a half walk, but it is such an interesting one. I would have to recommend the movie if you have not seen it yet. It was very good and set in Hawaii. We really enjoyed the story and the beautiful setting. Interesting to me was that so many people were going into Salle 1 and we were going to Salle 2. I kept wondering what movie everyone was going to see which was called La Taupe. I’ll keep you posted on that one. 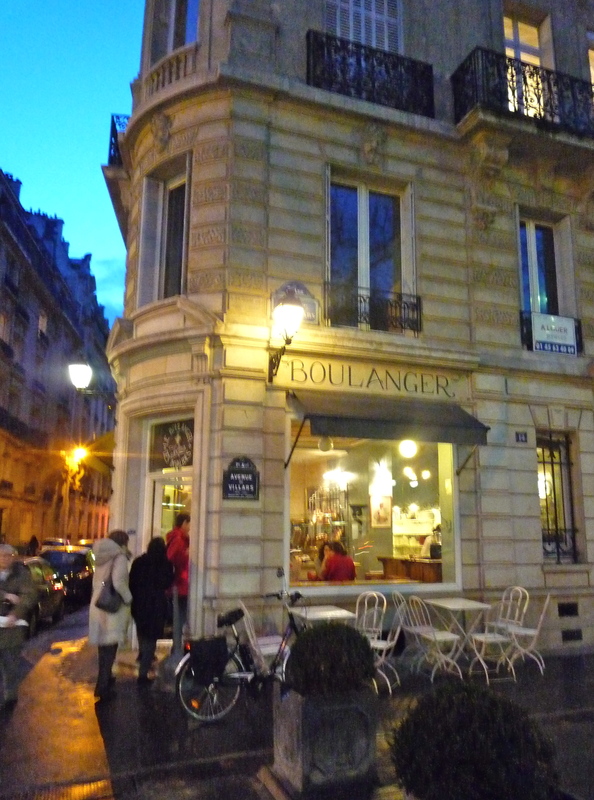 We left the theatre and stopped about a block away at a favorite little boulangerie on the corner. We had coffee and a pastry each and talked about the movie. On our way back we stopped at the little butcher shop to pick up a roasted chicken for dinner and then on to this little Italian specialty store. Several containers of olives, veal cutlets and roasted peppers later, we continued on. We then stopped to get bread. I made some roasted red potatoes in the oven to go along with the chicken and side dishes. 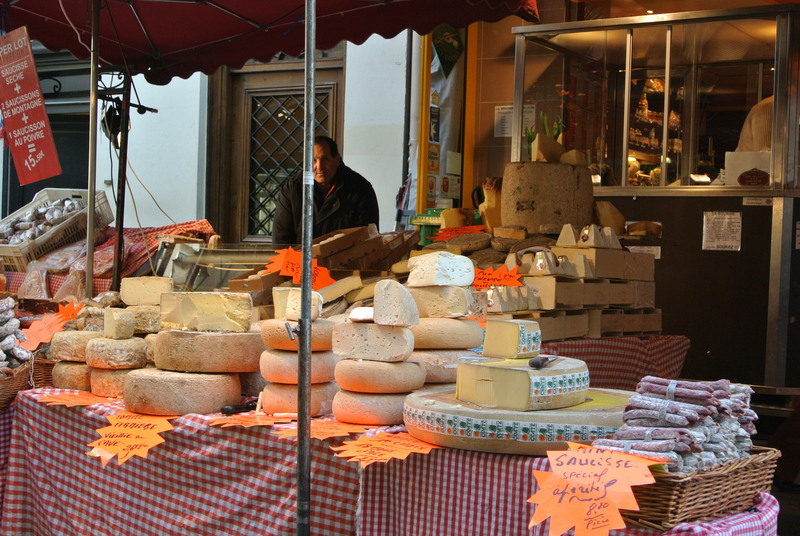 I treated myself to the hot potatoes, comté cheese, bread, olives, and left over Chinese rice. I was starving as the only thing I had prior to dinner was a morning yogurt. Oh, okay I did have a chocolate bar in the movies. So it was a great double-header movie day in Paris. P.S. Yesterday I found myself thinking about this movie so much, it just stayed with me. Every time my husband and I saw walking sticks, we would remark to each other that we need to get those in case we ever do La Camino. Actually, I think we would really love to every since we saw this story.